"For most devotees Santa Muerte is neither grim nor satanic. Instead, she is a saint who is as familiar to Mexicans as death itself. And her familiarity is reflected in her most common nicknames: Skinny Lady, White Sister, Godmother, Co-Godmother, White Girl and Pretty Girl. As godmother and sister, the saint becomes a supernatural family member, approached with the same type of intimacy Mexicans would typically accord their relatives. Much, of course, has been written about the uniqueness of the concept of death in Mexican culture. 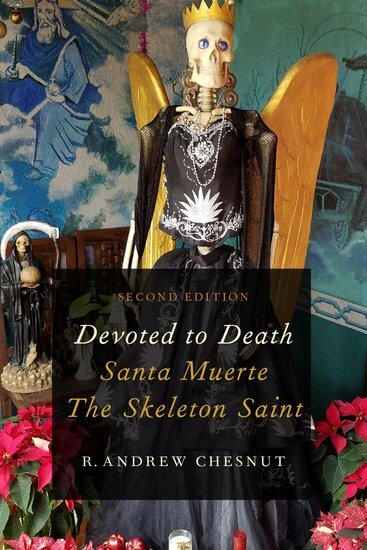 In his illuminating book on the subject, "Death and the Idea of Mexico," anthropologist Claudio Lomnitz even argues that death is totemic of the nation itself; that along with the Virgin of Guadalupe and 19th-century president, Benito Juarez, the figure of Catrina Calavera, the "playful skeleton." is one of the three great totems or powerful emblems of Mexicanness."